Twitter is one of the most renowned social networking sites that people can come across these days. Almost every business now has got online presence. This is because it is one of the most cost effective and productive ways of not only doing advertisement and marketing but also to do business. However, it is important to know that there are number of strategies that must be followed in order to do business online. When it is about marketing and advertising one’s business it is important that people make use of search engine optimization strategy and also various social networking platforms so that you are able to generate a wider customer base. By doing advertisement online one can certainly will be able to reach out to potential customers not only within the national territory but also internationally. Thus, you will able to do business even on a global basis. In a social networking site like Twitter one can make use of hashtags so as to better display information and factors. However, there are many people who are in the habit of over using hashtags. By doing this they actually think that it will make a bigger difference instead it will only make things worse. 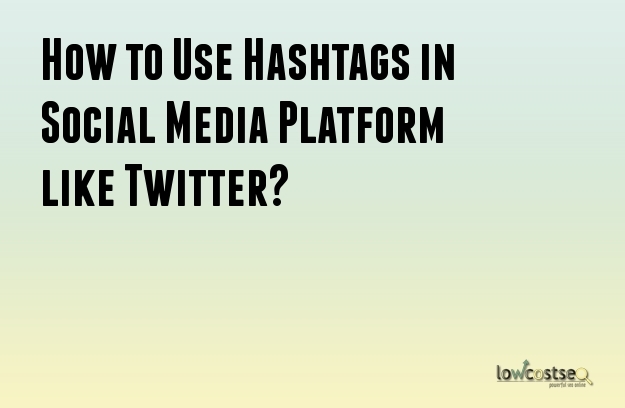 It is a known fact that hashtags are essential elements to be used in Twitter as a successful marketing strategy. This symbol basically helps people to find out a note or important information quickly. However, it is important that you are aware of the do’s when using hashtags. Here are certain tips for you to follow. First of all hashtags help your followers to notice something important that you have posted on your Twitter blog. Apart from that hashtags also helps in making your business be discovered easily. What are the tricks that you must use when using hashtags? Hashtags that have got images increases the chances of viewership and also helps in additional promotion and engagement. Images are able to attract the reader’s attention more quickly, thereby increasing the chances of your hashtag points to be read. You may be having more than one hashtags in your post but it is certainly not convenient for your readers to look around to gather information. This is the reason why it is best that you group your hashtag in one end of the post so that it is easy for people to read all your hashtags. Always make use of trendy hashtags so that it is easy for people to connect. Apart from that, a trendy looking hashtag will certainly draw the attention of your readers and increase the chances of your posts being read. You can be innovative with the use of your hashtags i.e. you can setup notifications in your hashtags for every time someone uses the tags. Before using hashtags it is important that you explore hashtags beforehand. Few hashtags with few or no related tags are not as popular as the hashtags that has got tags.